Make no bones about it, life is a struggle. From navigating the daily rat race, to raising a family, to trying to watch TV while enjoying a frosty brew from a giant mug. 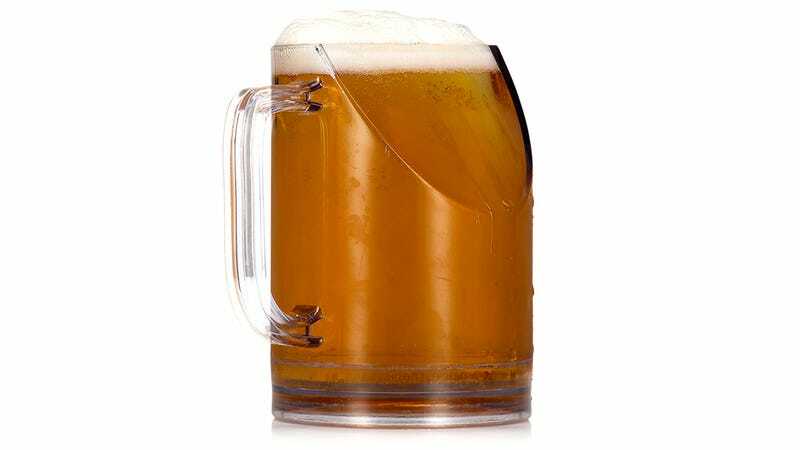 Every time you take a sip, the other side of the mug usually blocks your view, but not with the brilliantly engineered TV Beer Mug. Taking advantage of cutting-edge physics and engineering breakthroughs that are rarely seen outside of aerospace applications, this remarkable $11 mug looks as if one side has been cleaved clean off—which is the secret to how it works. The other side of the mug that usually blocks the view of your TV is gone, leaving you with a clean line of sight every time you take a swig. Someone get the Nobel Prize for awesomeness warmed up, because we already have our next winner.